Here you can create 5 stars and 6 stars Heroes using 3, 4 and 5 star heroes of given faction. Idle Heroes Strategy Game Guide. It is the only way to advance your heroes. Gather the required material for heroes to increase their star level up to 6 in the Summon Circle. Spent material heroes will grant certain spirits and promotion stones. Equipment on material heroes will be returned to your backpack. More heroes ensure more advance chances. You have to be careful when deciding which characters you want to create, because the process of acquiring the heroes is difficult and time consuming. You should already have a vision of what your team will look like at a later stage of the game, and you should only create those characters that are of good quality and who are useful for you. Sometimes it is worthwhile to wait for the creation of new heroes for a temporary Fusion Event (such events are repeated). At the bottom of this event we will receive additional rewards for creating heroes. "gathering all shards and heroes , do not make any 6* except for fuse event so we can collect all rewards"
If you miss one of the heroes needed for Fuse, you can try to change another hero of the same faction to the one you need. You can do this in Prophet tree. 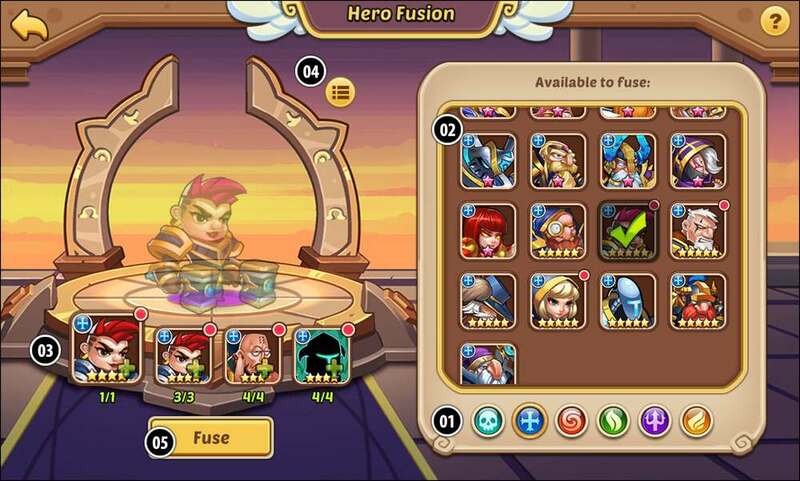 The level of the hero that follows Fusion will be the same as the level of first hero you add during the creation. Select the fraction that interests you. You can combine heroes only inside a faction. Select Hero you want to fuse. Heroes to which you have all the necessary components are marked with a red dot. List and the level of heroes you need to create your chosen character. Add the required heroes with the correct number of stars. 04 Features of the created character. Here you can see what features will be created by the heroic hero. 05 End the process of Hero Fusion. When you select this option and have all the required ingredients, here you will create a new hero. The process is irreversible. Select one host hero and then put in assigned material heroes to upgrade star-rank of the host hero. The host hero will keep its level, tier and gear. Sacrificed material heroes will converted into Spirit and Hero PromoTion Stone which will be collected in Bag. After Fusion, the host hero will gain more powerful stats and skill effect.